Mary will graduate from Uhuru Academy in 2019. She lives with her mom and younger sibling in Limuru. Because her mom boasts about her infamous cooking skills, Mary hopes to be a caterer in the future. 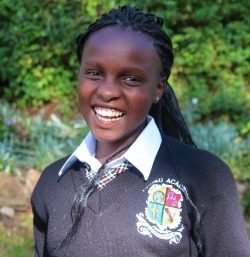 When Mary is not studying Math or Kiswahili, she enjoys singing and dancing in her free time. Mary is proud of her behavior, character, and ability to associate with different people. Click here to sponsor a student like Mary.